Clean, energetic, all in the head ‘Feel good!’ sativa effect of moderate strength and duration, without ceiling, tiredness in the body or hangover. A new Central American pure landrace sativa from Honduras that our team has recently reproduced. Honduras’ growing structure, flowering time, flower distribution and overall appearance are reminiscent of the old long flowering and high yielding lowland colombians. On the other hand, the effect and terpenes are closer to the old mexican sativas of clean, happy and positive effects. The effect has a stimulant component similar to the most exciting and nervous african sativas. A classical tropical sativa of high yield, high flower/leaf ratio, high vigor and excellent resistance against the adverse weather conditions of warm humid climates (rains, fungus). Excellent landrace sativa seed to work, for music, for outdoor activities, to socialize … good against migraine and apathy. Not recommended in case of anxiety, insomnia, heart problems or parkinson. Pure tropical sativa structure, tall, flexible, with strong branching and medium/tall node length. Floral, citric, woody and spicy. 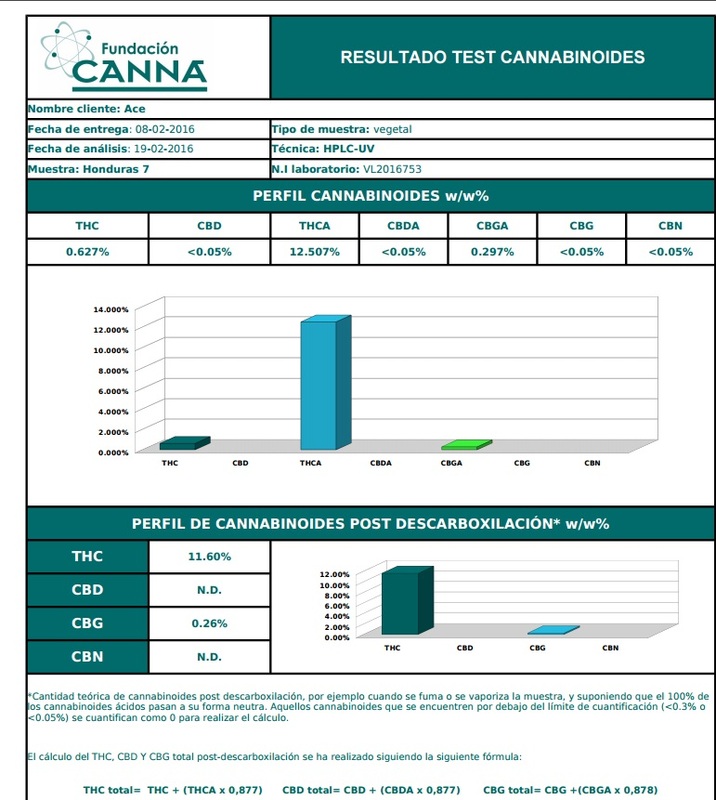 Complex and rich terpene profile. It mainly contains the following monoterpenes: high amounts of alpha pinene and terpinolene, followed by moderate quantities of beta myrcene, beta pinene and trans ocimene, with variability in the presence of limonene and linalool in smaller amounts. 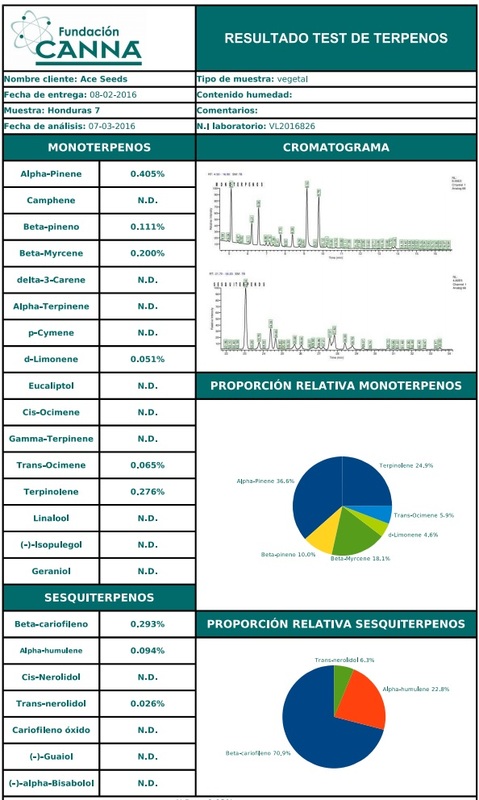 Sesquiterpenes: high amounts of beta-caryophyllene (¾ parts approximately), followed by moderate content of alpha-humelene, with variability in the presence of lower amounts of trans nerolidol and guaiol. It can be grown indoors with strong light intensity and with enough space for its development. For indoor growing with small space, we recommend to switch her into flowering after 15 days from seed, or starting from clones rooted for at least 7 days. Highly recommended for SCROG, horizontal or network growing due to its excellent yield in the lateral branches and its vigorous reaction to pruning. We recommend 11 (light) / 13 (darkness) photoperiod for the flowering indoors, in order to boost the flowering, and to avoid reflowerings or excessive stretching in early flowering. Outdoors, Honduras needs a tropical/subtropical climate or a warm coastal climate similar to Mediterranean to mature correctly. We recommend soft NPK levels in the growing stage, increasing PK from 3rd week of flowering. When Honduras is properly grown, the yield is very high, both indoors and outdoors. 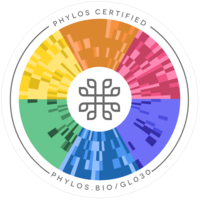 Genetic analyses performed at Phylos laboratories show that this strain has a unique and rare genotype of moderate genetic variability. Interesting sativa to develop sativa hybrids of huge vigor and yield, with clean and energetic effects.